Pita breads filled with fat-free bologna and a tangy mix of shredded lettuce, onion, tomato and fat-free ranch dressing make easy, tasty sandwiches. Toss lettuce, onion and tomato with dressing, set aside. Cut top 1/3 off each pita bread; discard or reserve for another use. 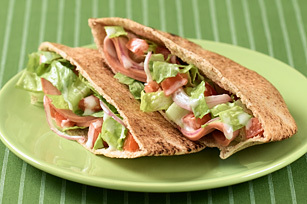 Fill each pita pocket with 2 bologna slices and 1/2 of the lettuce mixture. Substitute KRAFT Fat Free CATALINA Dressing for KRAFT FREE Sour Cream & Onion Ranch Dressing.